A marriage of fine peated malt from Islay and The Famous Grouse. 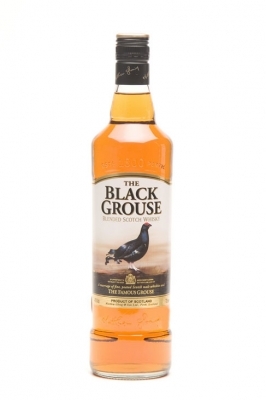 Black Grouse – Blended Scotch Whisky. We all sat down again with some high hopes especially when we noticed it was Islay where they got their peated malts from (you cant go wrong with an Islay). Not an easy bottle to find, my usual supermarkets (asda,tesco,sommerfield,coop and morrisons) did not stock it. On a visit to the Whisky Shop in Princes Mall Edinburgh also did not have a bottle. (even though they had it advertised in there most recent Whiskeria magazine, Christmas 2008) I eventually found a bottle in Sainsbury’s Linlithgow. It is out there but you may have to look a little harder than normal. Colour, we thought it was great a rich golden mahogany. Without further delay we began. Nose…Sweet peat and a woodiness, but with the addition of water a nose of laundered linen. Taste…Slightly complex with a sweet peatiness and a hint of fruit. Finish…Quite long but with no excitement. Nose…Burnt orange and caramel, turning to toasted cereal with the addition of water. Taste…Fruity on the front of the tongue with an explosion of smoke at the back. Finish… Long aftertaste of Cavonia cough mixture. Well that was interesting, we all like a wee Famous Grouse now and then, and we all really really really love all our Islay Malts, so what went wrong we were so disappointed in this little dram. Maybe we were expecting too much. Of all our tastings so far this one was by far the most disappointing, this is not to say, as a blended malt with the Grouse added it was of poor taste and quality, it was not, but as a union of the Grouse and Islay malts we thought it did not work, we did expect greater things, that can be the Whisky Boys fault, if anyone out there has recently tasted the Black Grouse leave a comment tell us what your thoughts are, and don’t be shy tell it from hip. I bought a bottle and tasted this after reading glowing reviews about this whiskey last winter. I am sorry to say, I am very disappointed. The first taste that hit me was a smokey creosote taste which seemed to linger and could not remove from my palate. My wife not a whiskey connoisseur concurred. I am sorry to burst anyone’s balloon but I think this scotch is a bit overrated or maybe this was just a bad batch. Hi Len, hope you enjoyed a wee lok though our site, from our review of Black Grouse we seem to agree this dram is certainly not one of the best around. This is a good scotch for the price. In Canada it costs less than Johnny Walker, Chivas, Balentines etc (all inferior in my opinion). While I agree that Aberlour or Macallan are far superior, Black Grouse is a good “everyday” Scotch for the cupboard. Good scotch for the price. Costs less than Johnny Walker, Chivas etc in USA. Of course not with the after taste of woods of the other ones but Black Grouse or the regular Black Grouse are a good “everyday” Scotch for the old retired ones!!! Got a bottle of it three weeks ago in London Heathrow on the way back home to the US because with the friends consider The Famous Grouse the greatest cheap Scotch you can buy. Haven’t tasted this one yet, but will do as soon as this weekend. Really curious after reading all the comments here, although a little dissapointed since I expected better. Will try to post after trying it. I really like the strong smoke taste. Black Grouse is not as good as the Islay single malts, but then it’s half the price here in the Chicago area. I agree-it’s a good “everyday” scotch. I approached the Black Grouse with no particular expectations and, as someone who drinks Islay malts exclusively for my scotch fix, I found the BG to be a fair compromise between a good single and something which I can enjoy a glass or two of daily without taking out a bank loan. At €20 for 70CL at my local Delhaize (Belgium) supermarket I found it to be quite peaty, reasonably complex and smooth enough to drink straight (my preference). I’ve tried several Islay blends (some oddly high-priced) and found the BG to be my favorite. Sure, it can’t compare to a proper 12yo-and-up single but then again it’s not €35 to €100+ a bottle either. My daughters ( 3 all over 21) are well aware my fondness for the odd glass of Famous Grouse. So on my Birthday (recently past) I was very pleased to unwrap a parcel containing a bottle of Black Grouse which I had made some noises about ‘that would be nice to try’ having seen the Tv adverts at Xmas. I will admitt to being very surprised and dissapointed to find I did’nt like it and wondered if this drink had any connection to the standard Famous Grouse whiskey. I have to agree with Lens comments in 2 above about the taste. I also asked my wife to try it who was equally confused at what she was drinking. I won’t be pouring it down the drain but it is gioing to last a long time. I find it to be an acceptable dram when I’m in the mood for something with a touch of smoke and peat but don’t have a bottle of single malt in the cabinet. Having said that it certainly isn’t anything special. As a real fan of the Famous Grouse, which I prefer to many higher priced whiskeys I was somewhat disappointed. I might buy a bottle again if I see it on sale but that would be about it. I think some points have been missed by some of the responses ….. It’s not an Islay Single Malt … what it is as some have said is very nice blend. FG is our house Scotch as a blend …. Black Grouse will become our house blend in the colder weather when we apreciate the smoke and peatiness of Islay single malts which are rather dear. Thanks to the folks at FG! Well, I like it. Not a big fan of th FG as a blend, finding it a bit insipid and lemony- almost as lemony as Grant’s- amd I like a speyside/highland in a malt (Glendronach 12, Abourlour 10 or Glenfarclas 10 for preference) but the Black Grouse I really enjoy as a whisky mac with a healthy dose of Stones. The peatiness cuts through the ginger sweetness and makes a real mouthful, full of flavour. Sorry people but I don’t like Black Grouse, please don’t change the Famous Grouse blend, I’m a big fan of Famous Grouse so I’m sticking to it. Cheers. Very seldom do blended scotches have a cork….This is reserved for the Single Malts. I would however, like to know the history of the cork as oppossed to the screw top. Can anyone explain please? I enjoy the Black Grouse… despite a lot of negative comments. 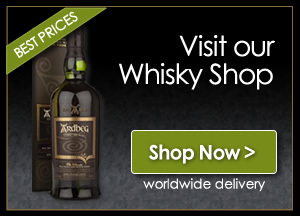 I love peaty whiskys and for the price… well, I’m quite happy to have a glass… or two! I guess everyone smells, tastes and experiences things differently. I have been drinking Glen Fiddich, MacCallan and Famous Grouse for many years until recently when my taste matured and turned toward the smoke and peat in Johnny Walker Black Label and some mild Islays. Well, I recently tried Black Grouse and I’m liking the mild peat smoke in this whisky very much. I find it a value. Thank you Mathew Gloag. Sorry, though I understand it’s a taste thing. This stuff reminds me of the smells in the doctor’s office I had to go to as a kid to be cured from everything from pneumonia to tetanus ( and those horrible “kid” shots!!!). I know it’s a learned reaction but in that context I can’t stand the stuff! There are a lots of peated ( some very expensive) scotches that leave me in this state of mind. Ironically there are many ( I don’t know why except they don’t have that nose) that I love. BTW, I’ll drink it and hold my nose anyway. I bought it in BC, Canada and can’t afford to throw it away. Having enjoyed a nice bottle of FG with my Brother in Law, Mike, and always enjoying the smoky peats from Islay, I decided to try the BG. I must admit – the peat did come through nicely, but the finish was an uneventul match. That said, I do look forward to a reasonably priced sip of FGB smoky peat and sugary smoothness, and I will enjoy it as a nice sipper. But I almost wish I would have spent the extra $10 on the FG 12 yr. Tried The Black Grouse in a tasting session tonight. What a terrible disappointment. Tasted liked someone had dumped some Liquid Smoke into a bottle of cheap young whisky. Raw and contrived it was rough and acrid. I think I will use this specimen as an example of a nasty dram at future tasting events… Good thing is that there are lots of other whiskys to try! Well – someone bought me a bottle of this the other week as a new year thankyou. Must say, I am a grouse drinker by nature so was intrigued to try this out. As everyone says a nice peaty flavour which sits well on my palate.I really really enjoyed it. If it was the same price as normal grouse and as readily available I would switch. Half bottle consumed with pleasure on Friday evening and no sign of any hangover the next day. That’s always a huge bonus in my book.